SINNER. SATANIST. SOCIAL worker. Saint. A strange progression taken by Blessed Bartolo Longo. On February 11, 1841, a sweet tempered physician's wife of Latiano, Italy, gave birth to a son whom she named Bartolo. Devoted to Our Lord and His Mother, she taught all her children to pray the Rosary daily and to visit and care for the poor, while Dr. Longo instilled in them a love of music and beauty. Bartolo would later describe himself as "a lively and impertinent imp, sometimes rather a rascal." The priests who educated him found Bartolo to be highly intelligent, cordial, and accommodating although prone to a fiery temper. When Bartolo was ten, his mother died. Slowly Bartolo began to drift away from his faith. Eventually he studied law from a private tutor, then attended the University of Naples to complete his education. It wasn't the same University of Naples where St. Thomas Aquinas taught, but a dangerous place for Bartolo's young mind. Searching for meaning in life, Bartolo became emneshed in the political movements and spiritism so popular with college students at that time in Italy. Deeply involved with a satanic sect, Bartolo aspired to the satanic priesthood, so he entered upon a long preparation of studies, fastings, and mortifications. On the night of his ordination by a satanic bishop, the walls of the "church" shook with thunder while blasphemous, disembodied shrieks knifed the air. Bartolo fainted with fright and for a while afterwards was deeply tormented and physically ill. Despite this depression and nervousness, he exercised his satanic priesthood by preaching, officiating at satanic rites, and publicly ridiculing Catholicism and everyone and everything connected with it. During these bleak years, the Longo family was besieging heaven for their wayward member. One day Bartolo seemed to hear the voice of his dead father begging him to return to God. Troubled, he paid a visit to one of his friends from Latiano, Professor Vincenzo Pepe, who was living and teaching near Naples. Shocked by Bartolo's appearance, Pepe exclaimed, "Do you want to die in an insane asylum and be damned forever?" When Bartolo admitted his mental confusion, Pepe took him under his wing. He introduced the troubled young man to many holy people who gave him support and counsel. One of these was a well-educated Dominican priest, Alberto Radente, who gave Bartolo a detailed course in the Catholic faith which included the writings of St. Thomas Aquinas. After much study, prayer, and a lengthy confession, Bartolo was again admitted to the sacraments. On the feast of the Annunciation, March 25, 1871, he was professed into the Third Order of St. Dominic and given the name of Brother Rosary in recognition of his favorite daily prayer. "I place myself, my God, in your hands; as a son I abandon myself to your fatherly embrace; roll and roll again this mud, it has nothing to say; it is enough that it serve your designs and not resist your will for which I was made. Ask, command, prohibit. What do you wish that I do, or that I not do? Lifted up, knocked down, suffering, dedicated to your works by sacrificing my will to yours, I can only say, as did Mary: 'Behold I am your servant. 0 Lord, let it be done to me according to your Word." "One day in the fields around Pompeii called Arpaia. . .1 recalled my former condition as a priest of Satan. Father Alberto had told me repeatedly never again to think of, or reflect on (this), but I thought that perhaps as the priesthood of Christ is for eternity, so also the priesthood of Satan is for eternity. 'One who propagates my Rosary shall be saved.' These words certainly brought an illumination to my soul. Falling to my knees, I exclaimed: 'If your words are true that he who propagates your Rosary will be saved, I shall reach salvation because I shall not leave this earth without propagating your Rosary.' At that moment the little bell of the parish church rang out, inviting the people to pray the Angelus. This incident was like a signature to my firm decision." Later he wrote, "What is my vocation? To write about Mary, to have Mary praised, to have Mary loved." Bartolo lost no time. He made repeated trips to the Valley of Pompeii to teach the people how to pray the Rosary. Beginning in 1873, he organized a yearly Rosary feast, incorporating music, fireworks, races, and a lottery into it. In 1875, as part of a parish mission, he invited a group of priests to speak about devotion to the Rosary. 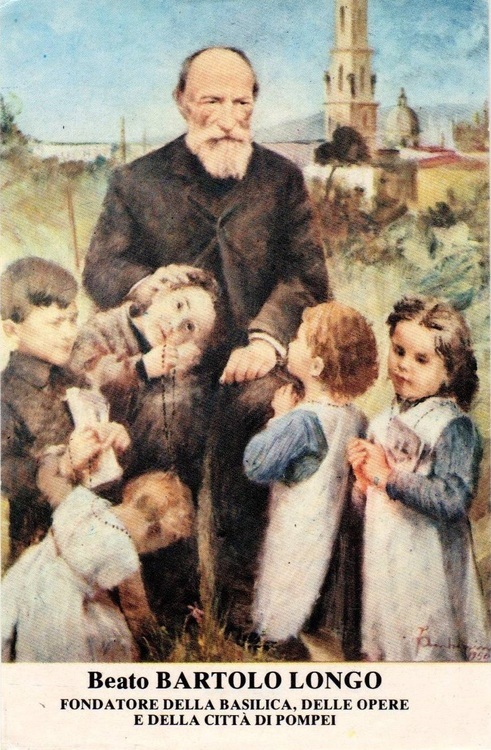 To conclude the mission, he promised to display a painting of Our Lady of the Rosary, and the painting that he obtained has been the cause of numerous miracles of healing. He constructed a church to hold this image and then, around it, an entire city dedicated to helping orphans and the poor. He also wrote books about the Rosary and composed novenas and a prayer manual. In all of these works, he was assisted by the Countess. When evil rumors began to spread about the relationship between the widow and the handsome, intelligent lawyer, Bartolo and the Countess consulted their friend Pope Leo XIII, a great devotee of the Rosary. "Lawyer, you are free; Countess, you are a widow; get married and no one can say anything against you." So on April 7, 1885, they were married. In this chaste union, for Bartolo had taken a vow of chastity, the couple continued their charitable works until the Countess's death in 1924. Bartolo was tireless in his work. He founded a congregation of Dominican nuns to help educate the orphans in his city and also brought in the Christian Brothers for the boys. He urged people to learn the catechism and worked to have defined by Rome the doctrine of the Assumption of the Blessed Virgin. After laboring fifty years for his "Lady," Bartolo was the object of calumny and slander as lies spread about his mishandling of funds. He bore these with resignation and was cleared of all charges. In 1906, Bartolo turned all his property, including his own personal property, over to the Holy See. He then assisted the new head of the administration and continued to work in the city he had built, but only as a humble employee. He remained at his work at the Shrine until he was 85-years-old, ever promoting the Rosary and going to confession twice weekly.